I recall watching Born To Be Wild, a 3D IMAX film back in 2011, about the rescue efforts underway by brave and selfless humans who valiantly try to right the wrongs committed by poachers and habitat encroachment. The film focused on the plight of the orangutans and elephants, and as Morgan Freeman narrated the short film in his famous dulcet tones, I was at once dismayed by the depravity of human cruelty and then uplifted by the sheer capacity of human generosity. I suppose it is true that to be capable of one, the other must also be possible. My tears of sadness and joy within the 40 minute running time were testament to that. Earlier this year, an opportunity to travel to Kenya for a friend's wedding came. Unfortunately I was not able to go, but thankfully my best friend went to represent us both, and in return I received a most wonderful gift. A small bunch of the wedding guests who had traveled around the world to be there for the nuptials were treated to an afternoon at the David Sheldrake Wildlife Trust, that was featured in the film. The foundation does amazing work in rescuing and rehabilitating orphaned elephants who are the victims of merciless poaching. I cannot do justice to the incredible work they do here - all I can ask is that you visit their website, or watch the film. I challenge you not to be moved after you do so. To cut a long story short, as a souvenir, my best friend gifted me the most amazing present possible of sponsoring an elephant in my name. I was adamant that I did not want any knick-knacks that went on a shelf collecting dust, so I was thrilled when this little elephant came into my life. 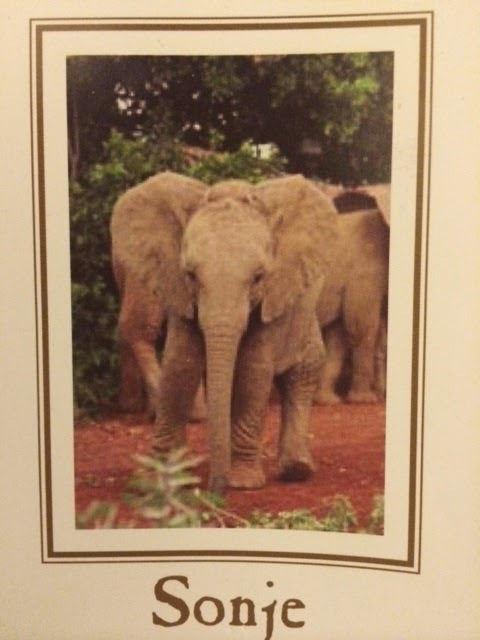 I am now proudly one of little Sonje's foster parents, and a beneficiary to the foundation, where the money goes to help all of the elephants in their care. Little Sonje, a yearling, was found on her own on the eastern boundary of the Tsavo East National Park. She was a milk dependant orphan with a huge, hard swelling on the top joint of her right hind leg (possibly from a poorly healed fracture), and two small scars at the site of the injury indicating a possible arrow or spear wound, leaving the calf with a pronounced limp. The rescue team named her Sonje, the Mliangulu word for 'lame.' She was lucky to be found alive as a hungry lion, who was known to be in the vicinity, would have undoubtedly made a meal out of her. So now I get monthly updates of my little girl's status, including photos, along with a watercolor by Angela Sheldrick. I also receive news about other rescues and in general am treated like one of the team, which is heartening to say the least. As a proud Papa, I just wanted to share (and boast). Here's a little picture of her below. She's got my ears.